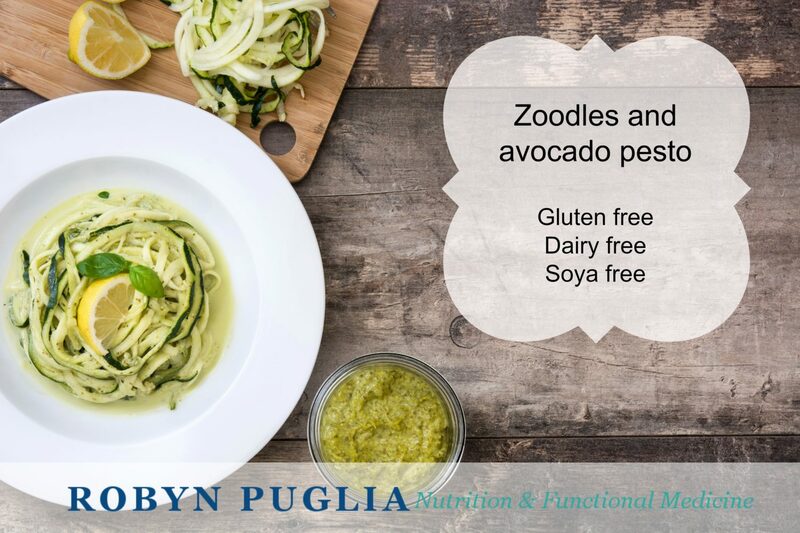 Gluten-free, allergy-friendly pesto, packed with nutrient-dense ingredients turns this dish into a creamy and delicious entrée. For more protein stir a can of rinsed garbanzo beans into the pesto before tossing with “pasta”. Allow one medium sized zucchini per serving. Zucchini should be about 1-1/2-inch/2-4 cm in diameter (do not use thin, baby zucchini). Spiralize zucchini using a spiralizer, blade C; discard the central core of seeds; cut “pasta” into shorter lengths with clean scissors or knife. Optionally, cut a horizontal slit in the squash, not quite into the middle and spiralize; this makes half-moon shaped pasta. May use zucchini “pasta” raw or gently cook zucchini by either baking or sautéing. Bake: preheat oven to 400° F/205° C, place zucchini pasta in a 39cm x 27cm x 2cm (15.5″ x 10.5″ x 1″) baking pan; toss with 1 tablespoon olive oil and bake for 4 minutes. Immediately remove zucchini from pan, drain and place in large serving bowl. OR Sauté: in a large skillet, add zucchini and 1 teaspoon of olive oil, sauté over medium high heat for 2 minutes. Remove from pan and proceed with recipe. Cooking zucchini pasta will extract water from zucchini so it is important to drain if using cooked zucchini pasta. PESTO: In a food processor or blender, combine seeds, garlic, miso and lemon juice and blend until seeds are pureed. Add kale, parsley and basil; pulse until chopped and incorporated. Add avocado, additional oil and puree until smooth. Season to taste with salt and pepper. Toss “pasta” with pesto; fold in raw cherry tomatoes and serve. Sueson Vess is a professional chef, author/food writer and educator helping people eat healthier, especially those with food intolerances and others with chronic illnesses. She is passionate about nutrition and helping others achieve and maintain a “good for your health” lifestyle. There are always delicious, helpful and healthy solutions! Her focus is on “Foods with Benefits” – learning to increase delicious beneficial foods in your daily life. Sueson makes bone broth at Nature’s Own in North Carolina, and teaches cooking classes at FirstHeath and Duke Cancer Center. She is a regular contributing writer for Sandhills Naturally and Gluten-Free & More publications.